Based on the premise that more and more small businesses are on the move (or working from home), we wanted to create something on the High Street, that filled the gap between Starbucks and Regis serviced office space. 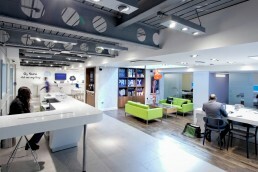 Customers can check in at a concierge desk, where they are allocated a choice of workspace that best suits their needs. 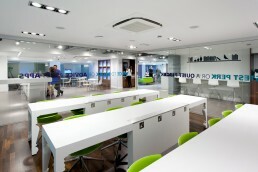 There is also a customer lounge and four semi-private meeting rooms. 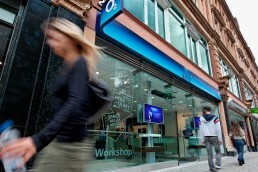 A seminar room in lecture format is also available, as well as a private conference room with interactive white board facilities, along with an O2 Guru for support and advice. The Workshop also plays host to weekly events designed to support and encourage local entrepreneurs and small businesses, working in partnership with organisations such as Start-Up Britain and Enterprise Nation.